The lab activity described here was adapted by Erin Bardar of TERC for the EarthLabs project. In this Lab students focus their attention on an area significantly larger than their study site as they apply their developing knowledge of local Earth system interactions to the regional scale. Although the scale changes, the questions remain the same. How does organism or process or event "A" influence, or become changed by organism or process or event "B"? Specifically, in what ways is my local region interconnected with adjoining regions? What types of matter and energy cross the regional boundaries to help define and shape the neighboring regions? Although students will investigate the region in which they live, the concept of a "study site" changes: instead of focusing their attention on an actual plot of land, students will investigate their region by combining their personal knowledge of the region with information they can learn from Google Earth. predict how changes in the input or output of one component of a system might affect other components, reflecting the concept that parts of a system shape each other through their interactions. 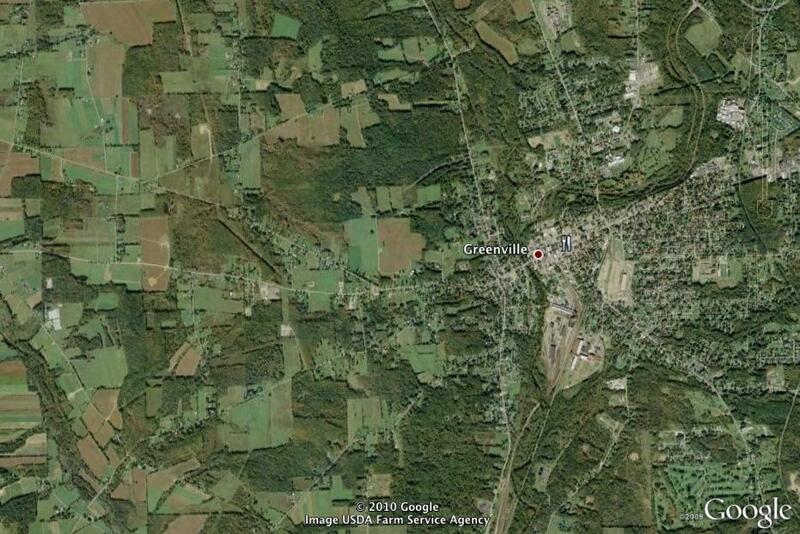 Google Earth image of region surrounding Greenville, PA. Click image to enlarge. If students do not have access to computers with Google Earth, they'll need to download that program in Part B of this Lab. In Part A: Students will look at diagrams and descriptions of study sites from other regions, and compare them with their own. In Part B: Students will use Google Earth to define a region around their local study site. In Part C: Students will consider the inputs and outputs of their region and predict how changes in those inputs and outputs might affect other components of the Earth system. To download one of the image files below, click on the thumbnail to open the full-size image. Then, right-click (control-click on a Mac) the full size image and choose "Save File As." To download one of the PDF or Word files, right-click (control-click on a Mac) the link and choose "Save File As" or "Save Link As." This file is only accessible to verified educators. If you would like access to this file, please enter your email address below. If you are new to the site, you will be asked to complete a short request form. If you have already been verified by the EarthLabs project, you will be taken directly to the file download page. In Part A: The sketches of four different regions that students study may dramatize the concept of regional differences, but they also set the stage for helping students to think about some of the factors that can define a region, including climate and water resources. The key questions are: In what ways are these regions similar, and in what ways are they different? In Part B: It's likely that many students will use human-made vs, natural boundaries to define a local region. This can help keep a defined region a manageable size in terms of understanding its character and identifying the inputs and outputs of energy and matter. However, this may also result in the local "region" being very similar in many ways to the surrounding regions. This will not detract from the process of identifying ways in which matter and energy move into or out of a region, and the ways in which such inputs and outputs help shape the nature of the region. If you have access to technology such as a SmartBoard, consider having students project their Google Earth image, draw the boundaries on the image, and label the inputs and outputs. Different student groups can use different colors so that the entire class has their information on the board. This would be an excellent way to have a class discussion about the study site and regional influences. In Part C:: You may want to give your students an opportunity to discuss systems, both open and closed, in a more general way before they start work on Part C. Can a bicycle be thought of as a system? Is a bicycle also an interacting set of systems? What are they? Can they define the interacting elements of the circulatory system? Is it an open or a closed system? You can assess student understanding of topics addressed in this Investigation by grading their responses to the Stop and Think questions. Lab 3 activities have been correlated to Texas Essential Knowledge and Skills (TEKS) standards. (A) demonstrate safe practices during laboratory and field investigations. (I) communicate valid conclusions supported by data using several formats such as technical reports, lab reports, labeled drawings, graphic organizers, journals, presentations, and technical posters. (B) communicate and apply scientific information extracted from various sources such as current events, news reports, published journal articles, and marketing materials. (C) describe and interpret Earth surface features using a variety of methods including satellite imagery, aerial photography, topographic and geologic maps, and apply appropriate technologies such as Geographic Positioning Satellite (GPS) receivers and Geographic Information Science (GIS) software. (D) discuss mechanisms, such as atmospheric carbon dioxide concentration, major volcanic eruptions, changes in solar luminance, giant meteorite impacts, and human activities that result in significant changes in Earth's climate. (A) describe how changing surface-ocean conditions, including El Niño-Southern Oscillation, affect global weather and climate patterns. Lab 3 activities have been correlated to the following National Science Education Standards. 12ASI1.3 Use technology and mathematics to improve investigations and communications. A variety of technologies, such as hand tools, measuring instruments, and calculators, should be an integral component of scientific investigations. The use of computers for the collection, analysis, and display of data is also a part of this standard. Mathematics plays an essential role in all aspects of an inquiry. For example, measurement is used for posing questions, formulas are used for developing explanations, and charts and graphs are used for communicating results. 12ASI1.6 Communicate and defend a scientific argument. Students in school science programs should develop the abilities associated with accurate and effective communication. These include writing and following procedures, expressing concepts, reviewing information, summarizing data, using language appropriately, developing diagrams and charts, explaining statistical analysis, speaking clearly and logically, constructing a reasoned argument, and responding appropriately to critical comments. 12CLS5.6 As matter and energy flows through different levels of organization of living systems — cells, organs, organisms, communities — and between living systems and the physical environment, chemical elements are recombined in different ways. Each recombination results in storage and dissipation of energy into the environment as heat. Matter and energy are conserved in each change. 12DESS2.2 Movement of matter between reservoirs is driven by the earth's internal and external sources of energy. These movements are often accompanied by a change in the physical and chemical properties of the matter. Carbon, for example, occurs in carbonate rocks such as limestone, in the atmosphere as carbon dioxide gas, in water as dissolved carbon dioxide, and in all organisms as complex molecules that control the chemistry of life. Remember that a system is defined as a set of elements that interact within a boundary. Systems are characterized in different ways, depending on how they interact with the environment that exists outside of their boundary. An open system is one that exchanges matter and energy with the environment outside of its boundary. Humans are open systems: we each have elements that interact with our boundary (skin) but we also exchange both matter and energy with the environment in which we live. A closed system is one that may exchange energy but not matter with the environment that exists outside of its boundary. Earth is essentially a closed system. Energy from the sun crosses the boundary (top of the atmosphere) to enter the system, and energy radiates into space. Meteoroids add tiny amounts of matter to Earth, and space vehicles sometimes remove matter, but these are insignificant in comparison with Earth's mass, so it is considered a closed system. An isolated system is one in which neither matter nor energy cross the system boundary. In reality, no system is truly isolated, but in certain realms of mathematics or science it is sometimes useful to consider a system as isolated for purposes of analysis. A natural region is a geographic area larger than the local study site that is characterized by some common natural feature or features that differentiate it from neighboring regions. Examples of natural regions include a mountain range, an urban area, a watershed, a peninsula, a hardwood forest, and a coastal plain. One can also consider as a region an area defined by human-made boundaries such as highways and railroad tracks. Such regions may not be distinct from the areas on the other side of their boundaries, but they can nevertheless be studied in the context of earth system processes. A region that is useful for classroom study is most likely one that is smaller than most natural regions, one that has an area students find manageable to study. You can use maps from Google Earth or Google Maps as resources when students work to define a region. Regions will have the same types of interconnections between elements that occur at the local level, but in addition, regions interconnect at a different scale. Regions exchange both matter and energy with other regions, in a variety of ways. For example, a region's inputs or outputs related to the atmosphere can include heat energy, dust particles, and liquid or frozen precipitation. Flowing water (the hydrosphere) will similarly move matter and energy into and out of regions. Human traffic and the movement of birds and other animals (biosphere) across regional boundaries are also responsible for exchanges at the regional scale. Another significant input to a region is the heat and light it receives from the sun, which changes across the seasons as well as from day to day. The nature of a region depends not only on what is within its boundaries but also on the inputs to and outputs from the region. When these inputs are outputs change, the region itself changes. A region will change (short term or long term) if atmospheric changes result in more or less precipitation coming into the region, or if a dam is build upstream or downstream, or if the prevailing wind changes, or if there is a dramatic influx of people into or out of the region.